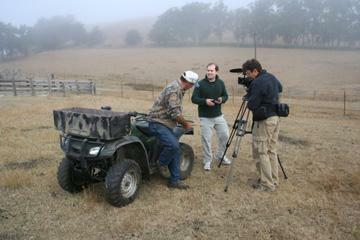 With funding from the Marin Community Foundation and the County of Marin, UCCE has begun filming a documentary about West Marin agriculture to bring the lives and work of our farmers and ranchers "over the hill" to the eaters of that food in the greater Bay Area. Cooperative Extension has joined with Novato Public Access Television (NPAT) to produce the video piece; which is being recorded in high definition. Rick Tucker, Executive Director of NPAT, is the executive producer, with Dave Fix as videographer. Dave has shot video for KRON for twenty-five years. Both Rick and Dave are enthusiastic about the project. "We would like to produce a timeless piece that will bring this story to a wide audience," noted Rick. "Shooting the documentary in high definition is the way to go," said Dave. "This technology will do justice to the subject and farmers that we film." Ellie Rilla and Steve Quirt are the creative directors. "Being so familiar with the farmers and ranchers is a strong point for us. We aren't interviewing strangers. We are talking to people who we work with on a daily basis. These are our friends and partners," emphasizes Ellie Rilla. The documentary will air on local public television stations in the late fall, and will be available for schools, libraries, and the public in DVD format.